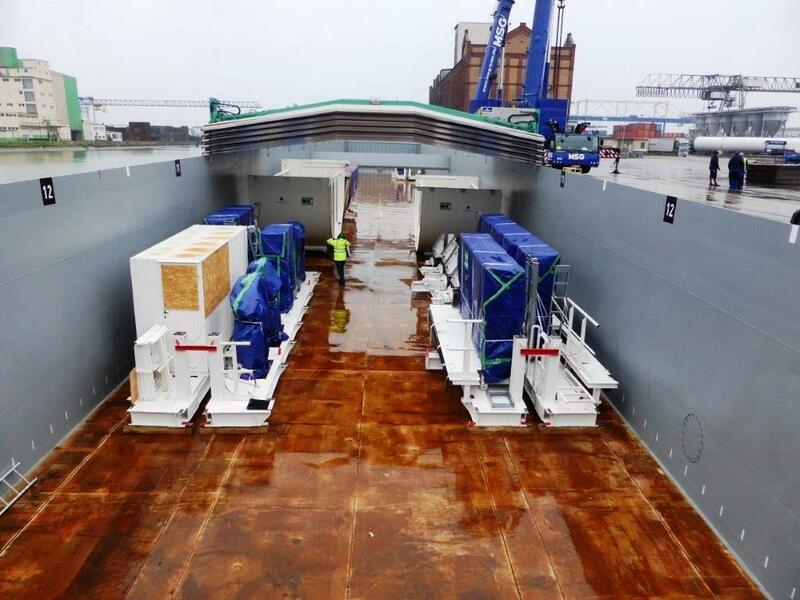 The above photos were taken in Rotterdam, where parts for the tunnel boring machine for the Crenshaw/LAX Line were recently loaded on the ship that will bring them to North America. 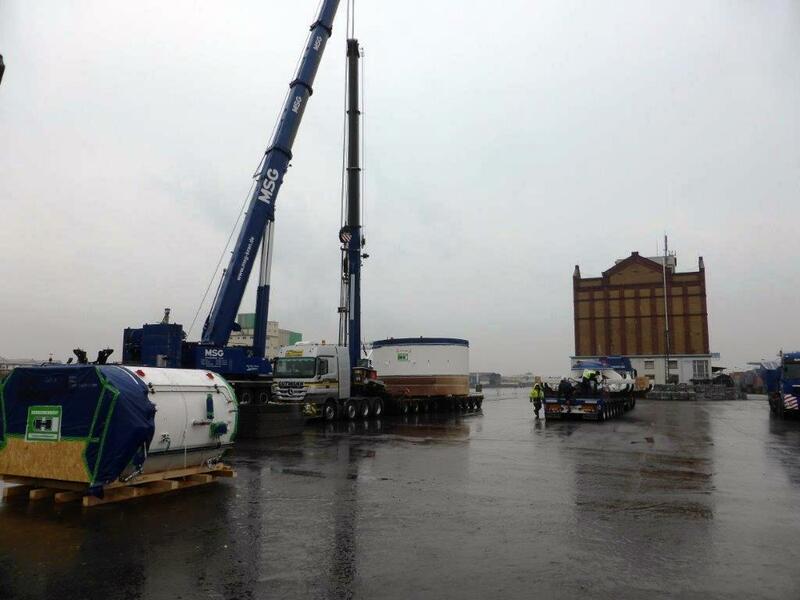 The full shipment of TBM parts is expected to arrive in Los Angeles by the end of the year. Once received, the parts will be assembled and the TBM will be ready to start digging the underground portion of the project by mid-2015. The Crenshaw/LAX Line is an 8.5-mile light rail line that will run between Exposition Boulevard and the Green Line. The project is heavily funded by Measure R, the half-cent sales tax approved by L.A. County voters in Nov. 2008.
are we naming our TBMs? Don’t know yet, but wouldn’t be surprised if names are given. Of course, Metro Construction Relations is working to organize a competition to name the tunnel boring machine,stay tuned for more details. Hmm. It is traditional to give names to moles, e.g., Mom Chung and Big Alma, from the SF MUNI Central Subway. Has our mole been given a name? Has it been publicly announced? Just curious: why are we digging the Crenshaw line tunnel before we dig the Purple line extension? Or will we eventually have 2 TBMs running at once? The Crenshaw/LAX Line project has been a couple years ahead of the subway project in terms of planning, engineering and construction. The Crenshaw project has target opening of 2019, so they need to get going on the most complicated part of the project — the underground segment beneath Crenshaw Boulevard. Just wondering: with multiple transit tunnels Metro will be digging for at least the next decade, will these TBMs that will be used for the Crenshaw/LAX Line also be used for the Regional Connector and the Purple Line Extension? As I understand it, mechanical moles are custom-built for a particular bore, and typically go into the “launch box” in pieces, are assembled there, and are then dismantled at the extraction point. It’s entirely possible that whatever pieces of the one for the Crenshaw bore are still in usable condition, and suitable for other bores in the system, could find their way into the moles for those bores. Also, keep in mind that even with a mechanical mole, a tunnel takes months to bore. I’ve never understood why people (myself included) are so fascinated by mechanical moles: they really aren’t all that interesting — they are, after all, just big boring machines. The TBM that will be used for the Crenshaw/LAX Line has been purchased by Walsh-Shea Corridor Constructors. What happens to the TBM after they’re finished building the Crenshaw/LAX Line is up to them – they could choose to sell it to the contractors building the Regional Connector or Purple Line Extension, or they might use it for their own future projects. We’ll know more as we get closer to major tunnel construction of the latter two projects. Is this a purchase or a lease? What diameter tunnel can be bored out with this? The TBM was purchased by Walsh-Shea Corridor Constructors. It will bore a tunnel that is 21 feet 5.5 inches in diameter. Is this so-called ‘Crenshaw/LAX line truly going into LAX? If I remember correctly the green line is south of LAX. Please clarify the true destination of the ‘Crenshaw/LAX’ line. Please see this map: http://media.metro.net/projects_studies/crenshaw/images/140207_map_project_crenshawlax_eng.pdf. Metro is also planning an additional station at Aviation/96th Street that will provide a transfer to a people mover being built by LAX that will take passengers to the airport terminals. Hasn’t anyone thought about using a machine known as a “subterrene”? A subterrene can bore its way through the earth, but instead of using mechanical means, it literally melts its way through, leaving behind itself a solid, glass-like lining which is impervious to all liquids and gases. The subterrene, in the ground upon which L.A. sits, can bore its way through at the rate of more than seven miles per DAY. This means that tunneling can be performed very quickly, and at VERY LOW COST! Just one slight problem: heat rises, and there are natural gas mains under the street. Oh well, another problem to be solved.